March 1, 2017 San Antonio ‘Social Host Ordinance’ In Effect. December 15, 2016, Social Host Ordinance passed by the City of San Antonio. Adults are responsible for making safe decisions for our own children. The State of Texas allows parents to serve alcohol to their own children, but that privilege does not extend to other people’s children. No other adult has the right to undermine my parental authority. My kid, my call. When adults provide alcohol and a place for kids to drink, they are not just violating others’ parental authority, they are breaking the law. Worse than that, they are showing teens that it is okay to break the law. And worst of all, those adults are creating a dangerous party situation which can lead to binge drinking, sexual assault, violence, drunk driving, and long-term consequences like addiction, academic failure, and poor mental health. There is no “safe place” for kids to drink. Every statistic on underage drinking tells us one thing- there’s nothing minor about underage drinking parties. In San Antonio, young people are drinking earlier and more often every year, but did you know that “parties” at private homes or on private property are most to blame? Kids who begin using alcohol before the age of 15 are 4.5 times more likely to suffer from substance abuse as adults than those who wait until they’re 21. 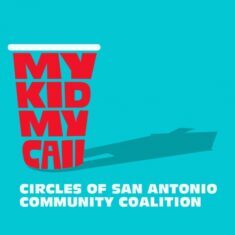 If you are interested in participating in the coalition work or other special projects, email the Circles of San Antonio Coalition or call (210) 225-4741.